During the warmer months, I block the second Wednesdays of each month off on my calendar, for those nights my dear friend Leni hosts a gathering on her front porch, simply known as “Second Wednesdays”. There are always interesting people to meet and good conversations to be had, mostly revolving around gardens and food, two of my favorite subjects. Leni is one of those people that I firmly believe the universe dropped into my life for a reason. She’s an amazing woman. Her website is currently down right now, but I can share this wonderful article published in Virginia Living two years ago about her. I’m proud to not just call her friend, but a kindred spirit. Through my friendship with Leni, I have made connections that have literally, transformed my life, starting with the discovery of lemon basil and how it sends my green bean basil pickles to a whole new level. Yesterday was the second Wednesday in June. It was one of those perfectly beautiful sunny June days, not too hot, breeze just right. I enjoy the drive out to Leni and her husband Kip’s almost as much as I enjoy my visits. Beautiful views of farmland and rolling hills nestled up against the Blue Ridge give way to windy, narrow country roads as you make your way there. 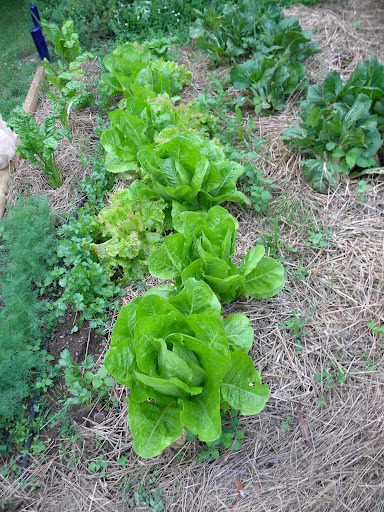 While wandering through Leni’s garden, I had a serious case of Romaine envy. How gorgeous is that? I have never had romaine look that good, not for lack of trying. She also had a new batch of chicks. I only stopped to ooh and aah over them briefly, as our chicks are expected to arrive sometime after Sunday and I am saving all my baby chick love for them. The piggies however, were another story. How cute are they? 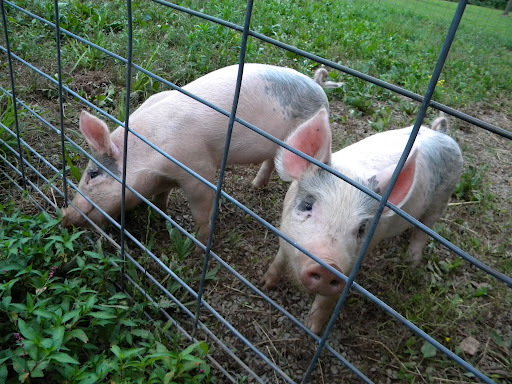 Edie suggested naming them Wilbur & Babe, but Leni had already thought of Prune and Pork Chop. Seriously adorable. When I asked Edie what she thought about us getting a pig though, she shut me down fast with a firm “No”. This as she was nibbling on some of Leni’s freshly baked bread spread with some of my Bacon Jam. Seems she’s content to leave it to our friends to raise pigs while we visit them and enjoy them in other forms later on. 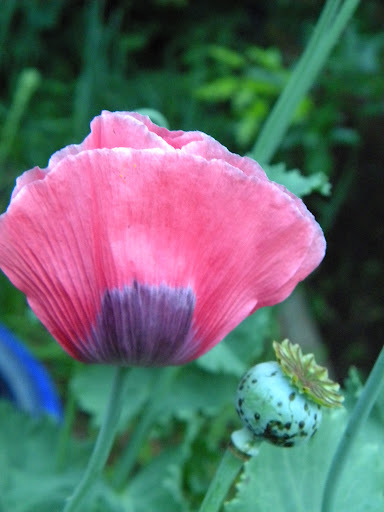 Also quite lovely to take in were the poppies. One of these days I’ll get around to growing some of my own. Until then, I’ll make myself content to admire those grown by my friends. There is something in the combination of landscape, conversation and company that always leads me feeling realigned in a way that I don’t always know that I need after an evening at Leni and Kip’s. Last night was no exception. As we made our way back into town, we couldn’t help but notice the sky to the west beyond the Blue Ridge still had a glow about it, which I like to think was the universe smiling in agreement as well. A Cake AND A Pie. A Feast for the King of the Castle. Lovely! Lovely post and lovely that you have such an interesting, kindred-spirit friend. 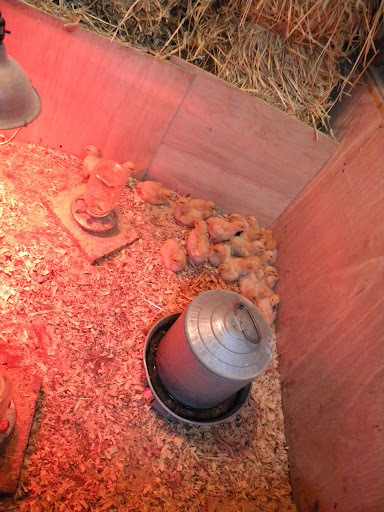 I saw bantam chicks at the feed store last week. They were about as tall as my thumb, multi-colored and just darling. Oh, the call was great, but I resisted. I'm so looking forward to seeing your new batch. Wonderful fun headed your way. We've raised pigs but found we just don't eat that much pork. Our friends captured a windfall of goodness before our pig pen became an incredibly lush garden. No fertilizer/compost needed for a couple of years.